A buckle is so named because the top buckles when it cooks. It is a type of cake with fruit dropped into the batter. 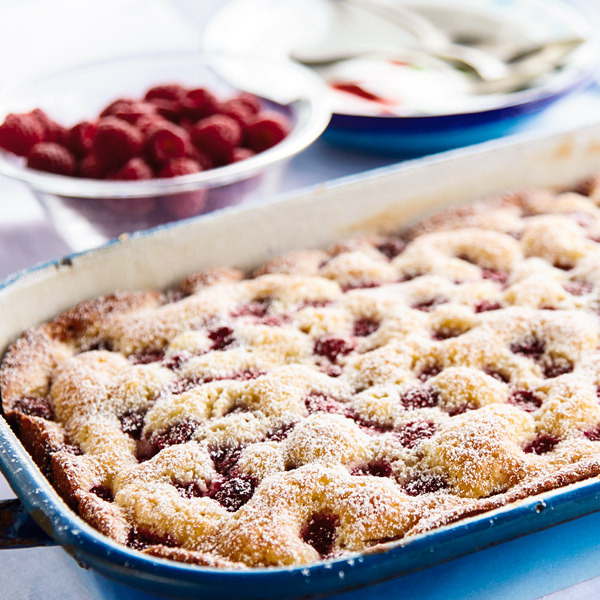 In this easy fruit buckle recipe, we feature the summer-sweet taste of fresh raspberries in the cake-like batter and also sprinkle them on top. Conduct your own yummy experiment using different types of berries or stone fruits to find out if raspberries take the cake, so to speak, for your family. Butter a 2-quart glass baking dish. Cream butter and sugar with an electric mixer until fluffy. Add eggs one at a time. Beat after each to combine. Whisk flour, baking powder and salt together. Then add it to the butter-sugar mixture gradually and slowly. Scatter berries on top. Bake 45 to 50 minutes. Try adding a teaspoon of vanilla or almond extract with a blueberry version. Yum!